Cooper’s worthy case is being ignored. On May 24 of this year, Donald Trump “pardoned” the deceased former heavyweight boxing champion Jack Johnson. A couple of weeks later, he commuted the sentence of convicted drug dealer Alice Johnson. What’s going on here? Has Trump suddenly developed a sense of justice? Has he suddenly developed an opposition to the racism of the criminal “justice” system? He and others can flip on Trump. Trump has good reason to worry that any or all of these actors could “flip” and turn government witness against him. 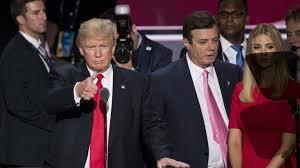 As one Trump ally put it, “When anybody is faced with spending a long time in jail, they start to re-evaluate their priorities, and cooperation (with the prosecution) can’t be ruled out.” A Trump pardon would relieve the pressure on any of them as far as flipping. The other option would be for Trump to pardon himself. 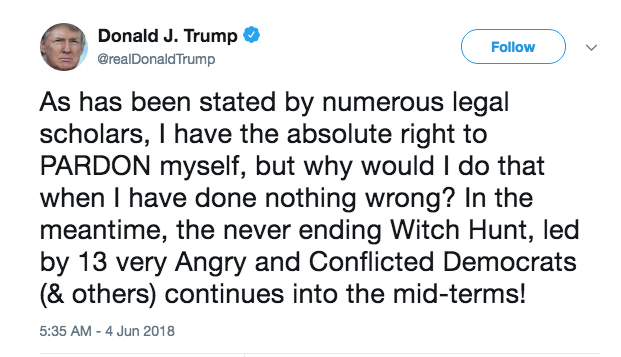 On June 4, Trump tweeted: “I have the absolute right to PARDON myself.” He – or at least his advisors – know that doing this would provoke a storm of protest, and he’s preparing the way. He and his advisors, from Kim Kardashian to Donald jr. – think (hope) that his actions regarding Alice Johnson and Jack Johnson will build some support in the black community. Some might think that a self-pardon would be overruled by the courts. That’s possible, but just as almost all tended to underestimate the chances of him getting elected, we can also be underestimating the degree that he has succeeded in establishing one-person rule. He’s taken over the Republican Party and, thereby, the legislature. He’s also come near to taking over the federal court system, as this article explains. Since the US Constitution is not crystal clear on the issue of a self-pardon, there is a legal loopehole which the courts could find to justify such an action. And, in the case of Alice Johnson, Trump’s commuting her sentence will also build support among evangelicals, since she is now an ordained minister. Don’t be shocked if at some point in the future, she comes out in support of the “godly” Donald Trump. This does not mean that she did not deserve to have her sentence commuted. Life without parole for a first time non-violent offender is ridiculous, but how many other thousands are serving similar sentences? And why is it that the far right website “The Federalist” called for her to be released? Meanwhile, Kevin Cooper languishes on death row in California. 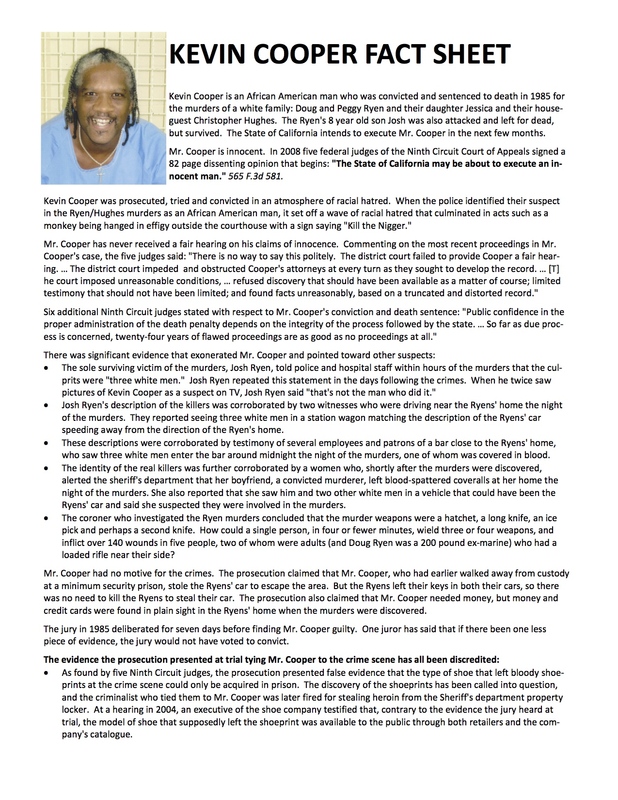 As the fact sheet shows, Cooper was framed up for a murder he did not commit. Nope, Trump has not suddenly seen the light as far as the racist and generally oppressive criminal “justice” system. As always, he’s just looking out for himself.